Souvenirs That Mean something but cost nothing. 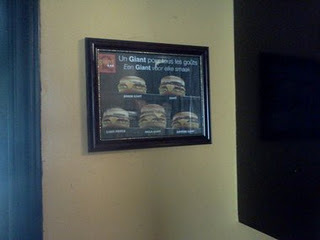 A framed place-mat from Quik Burger. So one of the topics I promised to write on, but haven't had the time to do yet was on souvenirs. "souvenir" is a cool word we get from the (oddly enough) French meaning memento, or more important remembrance. People love to take a piece of their vacation home with them, but you often end up with some Chinese made crap that you paid too much for, and which really has no sentimental value. "Let's remember plastic crap made in China, Yuck!" Since we're currently poor students, who just recently got back from travelling, and who stayed at a $12 a night Hostel in Cairo, I thought I'd share some of my souvenirs. Souvenirs that do have meaning, and were practically free. Feel free to try it yourself on your next vacation. You'll be glad you did. This particular one is from Quick Burger. I have a particular fascination with this chain and their "Giant" burger. It's written in both French and Dutch, so it's kind of got that cool foreign factor here in the U.S.- A conversation piece, whereas in Belgium-it's just another place-mat. Perhaps I'll frame some Taco Bell place-mats and sell them there? Either way it's uber cool, and better yet, it's the actual place-mat from our rainy day adventure in Ghent. On a side-note, since it has been hanging in my kitchen, I've craved and purchased more cheeseburgers than I ever have before. 2. 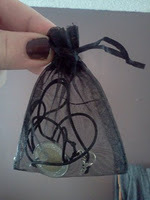 Make a necklace out of a coin. 3. Frame some paper money. 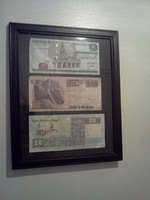 For the same reasons as above, we took some black construction paper and a cheap $3 frame and framed a some really radically cool money from Egypt. Perhaps when the dollar increases over the Euro, I'll frame some of those too. Or maybe I'll just frame the dollar when I find a way to escape and live abroad. This is a piece of the Great Pyramid of Giza. (No seriously!) I did not however break it off, but was offered to me as a "gift" from one of the desert dwellers. "A gift from the people of Egypt", he told me, asking for money in return. 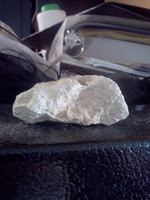 Now I'd never condone breaking apart things; but, often things like rocks on the ground can make really cool souvenirs. I suppose I could break it down further and give it out as souvenirs, however, I'll keep it how it is, preserved in my climatized, suburban home, unlike the poor other rocks belonging to our Egyptian "friend." Thousands of years old and it's in my house!! A rock, from the pyramids. 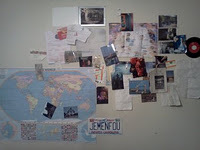 Welcome to my wall collage. I've got receipts from Great Western trains, pictures from the BBC, a Doctor Who map, a hand-written tray table for an upcoming book. All little memories, which could be scraped book, or in my case tossed on the wall, so I can sleep and dream of all the wonderful places I've gone, and all the people I've met. Some of the papers still smell like the places they've come from. I actually just started digging all this out of boxes and piecing it together a few weeks ago. Much more has to go up... but for now it's a start. So there you have it. Souvenirs don't have to be expensive, just memorable. Save your money on your next vacation and bring home some loose change and some trash.... soon you'll find what you've really brought home, is all the joys of your trip.